Congratulations! You did it! Finally, your baby is in your arms and the word “mother” has taken on a new meaning. Scared? Excited? Overwhelmed? If your baby had arrived in Santa Barbara, California, volunteers from PEP (Postpartum Education for Parents) would be ready to ease your adjustment to parenthood. Their Warmline service has been providing emotional support 24 hours a day, 7 days a week since 1977. I’m proud to be one of PEP’s founding mothers. It all began after I gave birth in Santa Barbara in 1972. My husband and I learned about labor but had no idea what it really meant to bring a baby into this world. No one had prepared us for the postpartum period. We were isolated from family, and had few friends. My husband went right back to his work, and I hid my growing anxieties, even from myself. My milk supply was inadequate, Stephen didn’t gain weight, an inguinal hernia required emergency surgery, and I had my first panic attack. All this before he was 2 months old. My personal journey into motherhood has led me to career in how to listen to new parents and to set up postpartum support organizations around the world. I was the first PEP volunteer for the Warmline that began on July 1st, 1977. Ever since that day, when I reassured a new mother that she wasn’t alone, or crazy, I’ve been providing free, non-medical, emotional support. I have also confronted my own history of loss, grief, and depression and how it impacted my first attempt to be a mommy. My experience and education about maternal mental health issues has translated into advocacy and action. What I have learned from my experience is that at least 10% of pregnant and postpartum women experience mood and anxiety disorders. In other words, they don’t feel “like themselves”. There is a direct connection between social isolation, and feeling “less than wonderful”. The pathways between a woman’s reproductive hormones, her brain chemistry, and stress levels are complex. They are impacted by genetics, having a supportive partner, a cooperative infant, and a good night’s sleep. This shouldn’t be a big surprise, and yet, the word “mother” triggers unrealistic expectations of mythical proportions. Denial and ignorance compound the problem that, if left untreated, can lead to depression, discord and trauma. Ten years after PEP was began, I organized the first annual conference on Women’s Mental Health After Childbirth. Postpartum Support International (PSI) was founded following that meeting. Our mission is to promote awareness, prevention and treatment of mental health issues related to childbearing in every country worldwide. Part of our vision is that a postpartum parent support network, like PEP, needs to be available in every community. In order to achieve this goal I have written two Guidebooks. 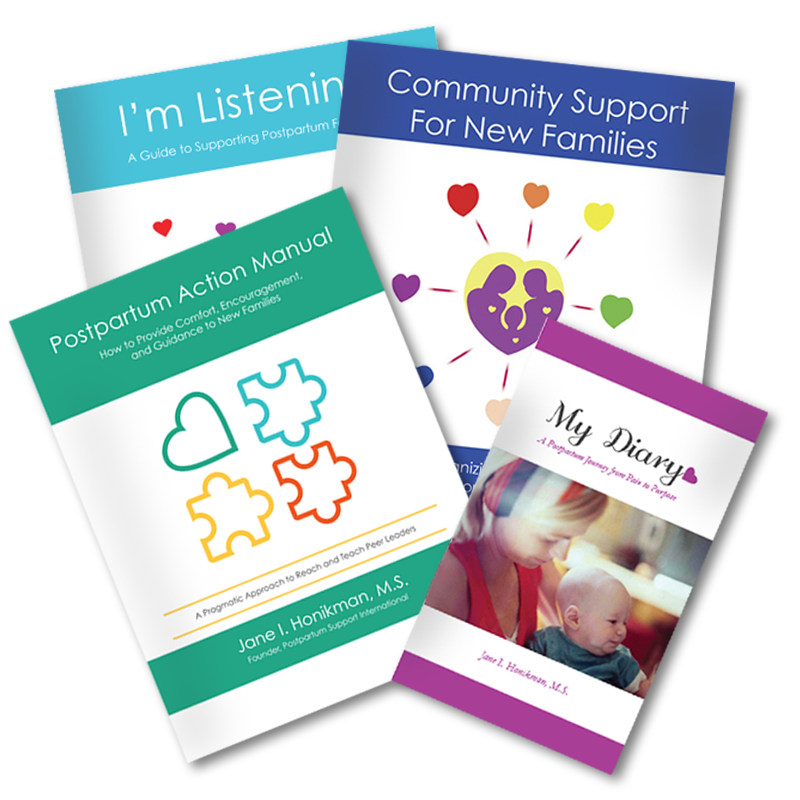 Step by Step and I’m Listening are designed to motivate individuals to make the transition to parenthood as smooth as possible. It isn’t difficult or complicated to provide assistance for new parents but it does require commitment, patience and time. For example, the Universal Message is a simple yet effective expression of validation, reassurance and hope that I say to each caller. The following “tips” are recommendations for those working with families. Know the facts about postpartum depression, be up-to-date on current research and treatment options. Know your local community’s resources and stay connected with other agencies and organizations. Be comfortable with the topic of mental illness, listen actively to what a woman is expressing and do not judge her. Offer accurate, written educational materials on the topic in a lending library that is affiliated with support groups. Build a network in your community and make appropriate referrals to others. Follow-up to know that the woman and her family’s needs have been met. I developed the following set of questions as a means to enlighten community leaders. 1. Do midwives and obstetricians assess all of their patients for psychosocial factors during pregnancy? If they do, what happens next? 2. Are pregnant women informed about mental health-related issues? If so, what happens next? 3. Are pregnant women who are at risk for mood and anxiety disorders referred to mental health professionals with postpartum training? If so, who pays for them? 4. Are midwives and obstetricians familiar with family support agencies and organizations and their services? If so, do they make referrals? 5. Are there free self-help support groups for pregnant and postpartum families? If not, is anyone going to start one? 6. Are childbirth educators informing families about the need for emotional and physical support after birth? If so, can the families afford these services? 7. Are hospitals and clinics distributing literature about maternal mental health and adjustment issues? Isthere a local referral phone number for new parents to call? 8. Do family support agencies offer services for postpartum families? If so, do they include phone and group support for mental health issues? 9. Do pediatricians and family physicians assess psychosocial and support needs for the first year postpartum? If so, what happens next? 10. Are new families encouraged to seek support for any and all mentalhealthissues? If so, congratulations—you live in a beautiful community! All women of childbearing age must know about her own and her family’s mental health history and share this information with her caregivers. An accurate assessment of a woman’s mental health must be completed at every visit to her caregivers during pregnancy and during her first postpartum year. All health professionals must provide written educational information, resources and treatment options for mood disorders related to childbearing in their offices. Timely and appropriate referral to other professionals must include follow-up by the referring party to insure quality of healthcare. There are myths surrounding motherhood that collide with the realities about maternal mental health. It is a myth that pregnancy is a universally glowing, happy time and that new parenthood is “the most wonderful time in your life”. The reality is that symptoms of depression and anxiety occur in ten to twenty percent of expectant and new mothers. This means that these emotional symptoms are the most common complication of pregnancy, affecting up to 400,000 women per year in the U.S. Warning signs during pregnancy or postpartum include difficulties with sleeping, eating, or caring for herself or baby; thoughts about hurting herself or baby; or intense feelings of energy, anxiety, or sadness. Depression and anxiety during pregnancy can decrease blood flow through the umbilical cord, resulting in low birth weight, small head circumference and possible effects on the baby’s brain development. Depression and anxiety in the mother after birth can affect the parent-child relationship, resulting in developmental, learning, and behavioral problems in the child. Depression and anxiety in the mother can also affect her relationships with others, particularly the baby’s father. Women are not to blame! Maternal mental illness is not a weakness, and women cannot will themselves well. Women with a personal or family history of emotional difficulties are at greatest risk. Postpartum obsessions, thoughts about harm that can come to the baby, affect 3 to 5% of new mothers. These thoughts represent no danger to the baby and can be distinguished from postpartum psychosis, in which there is a risk for the baby. Education is the first line of defense, for realistic expectations about new parenthood can decrease the occurrence of depression and anxiety. Help is available! These illnesses are treatable. For more information call Postpartum Support International (PSI) at (805) 967-7636. My vision is to reach concerned, caring individuals and show them how to help mothers struggling with postpartum depression (PPD). Maybe you are someone who can make a difference. Through training you can learn how to answer calls from all sorts of people: distraught women, upset husbands and partners, anxious relatives, and those just seeking information about PPD. My journey has proven that one individual can make a difference in supporting others through this important phase of life; motherhood. I encourage you to join me in supporting other women around the world reach their full potential.